UWP Series UHF synthesized wireless microphone system. Package includes a lavalier microphone, bodypack transmitter, plug-on transmitter and a portable tuner. Mounting adapter for camcorder included. Channels 42 to 45. 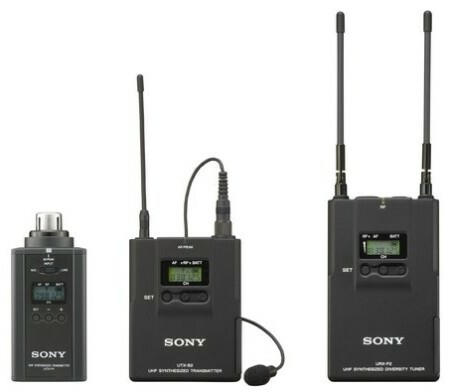 The UWP-V6 includes extremely robust metal construction, mic/line input selection on the bodypack and plug-on transmitters, a miniature metal body omni-directional lav microphone and plus the receiver includes a convenient auto channel scanning function allowing automatic search for unoccupied channels. Achieves stable transmission and reception by using a UHF PLL (Phase Locked Loop) frequency synthesized system, which provides accurate carrier signal frequencies. This system is used in both the transmitters and tuners, so that a stable carrier is generated at the transmitter, and accurately tuned in at the tuner. This PLL-controlled system provides highly stable, user-selectable frequencies in increments of 125 kHz. Typically, wireless microphone transmission systems can be subject to reception interruptions (signal dropout), but UWP series tuners reduce this to a minimum. By utilizing a space-diversity reception system, it achieves stable reception by using dual-antenna inputs/reception circuits. These receive signals over two different paths and automatically select the stronger RF signal for output. To avoid picking up carrier signals transmitted from other systems, the transmitter transmits a 32 kHz pilot-tone signal along with the audio signal. The tuner's squelch circuit recognizes this tone signal, and outputs the audio signal only when this tone signal is received. This function prevents the output of unwanted signals and noise from other signal transmissions in the air, as well as the RF noise and popping noise that occur when the transmitter is powered on or off. Simultaneous operation of up to 16 wireless microphones. Optimum combinations of practically tested, interference-free frequencies are stored in the tuner. By using the pre-programmed frequency groups, users can easily choose interference-free frequencies for the transmitters and tuners, simplifying the task of system setup.